Recently, I launched paint.net on my laptop and it wanted to update. ‘Why not?’, I naturally thought. But, it had slipped my mind that I had tried and failed to update paint.net on that laptop at some point not too long ago. The situation was a bit more curious than that: paint.net reported itself as version 4.0.5, while Programs and Features said paint.net 4.0.2 was installed. I didn't think it'd be too hard to rectify the problem – if it can't find the installation source for the currently installed version, then either the 4.0.2 or the 4.0.5 paint.net installer should be able to sort it out. Alas, therein lay the first problem: the official paint.net website only offers downloads for the current version. I did not have the installers for 4.0.2 and 4.0.5 in my downloads folder either, because I had used the auto-updater to update to them. The download URL for 4.0.9 is http://www.dotpdn.com/files/paint.net.4.0.9.install.zip. Changing the 4.0.9 in that to an older version seemed worth trying. Alas, while it downloads a zip file with the correct name, when you open it up it contains the installer for version 4.0.8. If the MSI file it wanted wasn’t from either of those two versions, what the hell was it? A bit of observance at this point paid off. I noticed that each time I ran the same paint.net installer, it dumped a new MSI file in the Staging directory. They were all identical, but each of them had a different number at the end of the file name. In other words, those numbers were being generated during installation. I then suspected that one of MSI files for 4.0.2 and 4.0.5 was in fact the correct one, but something was being picky about the file name and wanted it to match PaintDotNet_x64_1156888445.msi. 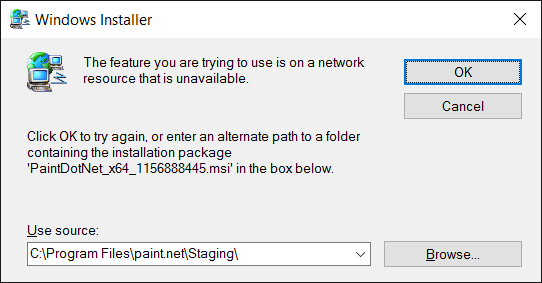 I tried renaming the 4.0.5 MSI to PaintDotNet_x64_1156888445.msi and pointing the uninstaller at it. It rejected it. I then tried renaming the 4.0.2 MSI in the same way. And finally, success! The damn thing uninstalled itself. I then proceeded to install the latest version of paint.net. I'm not entirely sure why I was in such a rush to do that. I can only describe the whole situation as a moronic mess. A little more digging revealed it was SetupFrontEnd.exe from the paint.net installer that was putting the MSI file in the aforementioned Staging directory, and it was using a pseudo-random number generator to generate the number it was putting in the file name.